They keep trying to say that the 40 year old Aboriginal art movement is doomed by the inevitable death if its elders. But just a decade ago, no one had heard of the Yolngu artist, Gulumbu Yunupingu. The then-56 year old member of the powerful Yunupingu dynasty in NE Arnhemland had been far too busy as a mother, a health worker – combining Western and bush medicine in her Dilthan Yolngunha healing centre – and, for 26 years, a translator of the Bible into her first language – Gumatj. Now, at 66, Gulumbu has died, feted with a permanent position in the Musee du quai Branly in Paris, with a 'Big Telstra' prize in the NATSI Art Awards, and with an exquisite room gathering her career's artworks together in the current opening show in Sydney's Museum of Contemporary Art extensions. Modestly, she painted the Universe – Garak – taking traditional Yolngu stories about the Milky Way and extending them to stars well beyond the reach of even the Aboriginal gaze; “everything beyond scientific exploration; everything that can be imagined” - as Brenda Croft put it in the catalogue to the First Indigenous Art Triennial at the National Gallery in 2007. 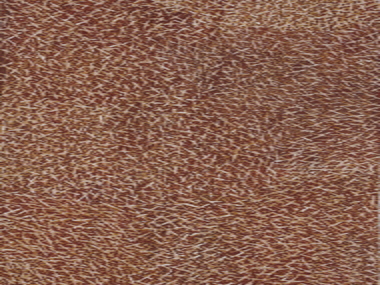 Her barks and larrikitj expressed this poetic Big Bang in a series of infinitesimal lines and dots developed by her from Arnhemland's traditional rarrking – an infinite variety of patterns that she made all her own. “I have this knowledge my father told me”, Gulumbu explained. And her father was none other than Mungurrawuy Yunupingu – clan leader and artist. He told her two stories. One about two sisters and their fires – seen in the sky competitively separated in summer but bonded closer together in winter; the other about the Seven Sisters (the Pleiades – meaning sailors in Greek) – stars that rise together and reassured both civilisations that navigation (and hunting) at sea was at its safest. These stories came back to Gulumbu one night “when we were sleeping outside, my sisters and me, and we were looking up in the beautiful sky...it was bright and blue with light stars everywhere. When I woke up, I had this vision and was told, 'Do this'. Then I got these rocks and paints and brushes and hairbrush and then I did this first one....little piece of bark...and then I tried these stars”. And these stars made her a star! From 70 tiny barks in the Basic Needs pavilion at the Hannover World Expo in 2000, she built to her first solo show at Alcaston Gallery in 2004, a couple of appearances at the Melbourne Art Fair, selection in the Kerry Stokes Larrikitj Collection and public art commissions in Paris and Canberra. The launch of that 7 by 3metre work on wood, Garrurru (Sail) in the Hedley Bull Centre for World Politics at the ANU was Gulumbu's last public appearance – a risk she was determined to take despite ill-health. But then she was Mungurrawuy's daughter. In many ways the elder trio of his offspring reflected the breadth of his huge character – Galarrwuy the politician, Mandawuy the teacher and promoter of Yolngu culture through music, and Gulumbu the healer and universaliser. Of course there are also sisters Nypanyapa and Barrupu – no mean artists in their own rights. And Gulumbu had great faith in her fellow artists. After the MCA re-opening, she offered this tearfully stated credo: "The truth lies in what every artist has to say; there is healing for people when they see beauty". But Gulumbu was equally able to draw tears from her audience – achieving this repeatedly when she took on much of the public speaking for the eight Aboriginal artists involved in the Quai Branly commission: "This is from my heart to you, to share", she told her listeners; "for the whole world to understand my culture". For her stars are a reminder that people should work towards harmony: "We can all look at the stars, whichever sky we're looking at," she said.